Acadia National Park is located in the northeast corner of the continental United States, along the Atlantic coastline in the southern part of Maine. If you are planning on flying in from a different region or country, flying into Bangor, Maine is a good option. Bangor International Airport (BGR) is a smaller airport, but Delta and a few other carriers have regular flights, and several of the major car rental agencies have stands right at the airport. Bangor is only 50 miles north of Acadia National Park so it is a convenient 90-minute drive from Bangor to Mount Desert Island, Acadia National Park, and the tourist town of Bar Harbor. Bangor is also only 90 miles south of Baxter State Park and Mt. Katahdin (the northern terminus of the Appalachian Trail). If flying into Portland, Maine, it is roughly 175 miles and a three-hour drive and from Boston, Massachusetts, it is roughly 280 miles and a five-hour drive (in ideal traffic conditions). 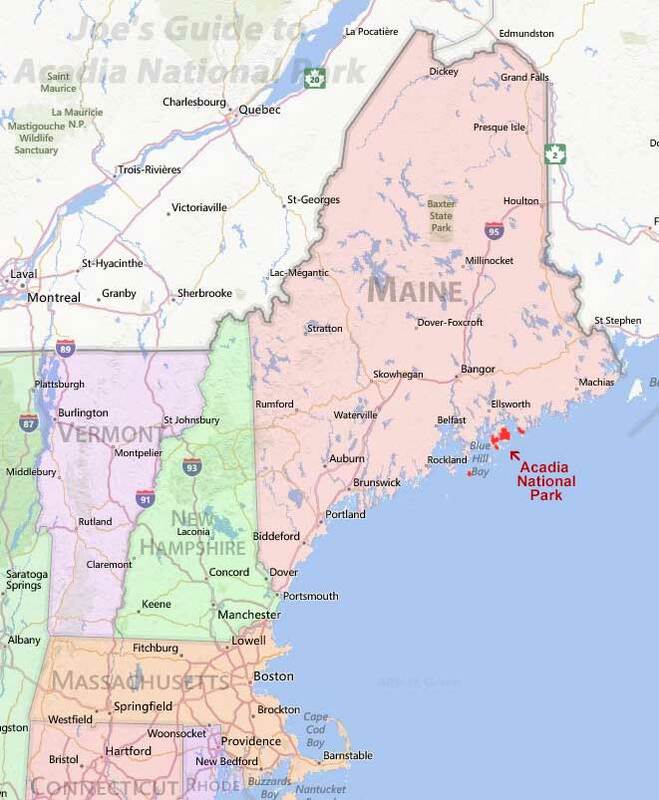 If driving up the Atlantic coast to get to Acadia National Park, I-95 is the major interstate that heads up the Atlantic coast towards Maine. Near Bangor, take the I-395 spur to Route 1A which heads southeast towards Acadia National Park. In Ellsworth, continue south on Route 3 to reach Mount Desert Island. Once on the island, Route 3 turns left and follows the coastline clockwise towards Bar Harbor. If heading towards Southwest Harbor, take Route 102 due south towards the "quiet side" of the island. The majority of Acadia National Park is located on Mount Desert Island, but the Schoodic Peninsula is the only section of the park on the mainland of Maine. From Ellsworth, drive 19 miles east on Route 1, then head south on Route 186 to the Schoodic entrance. Southwest of Mount Desert Island is the smaller and relatively remote Isle au Haut. 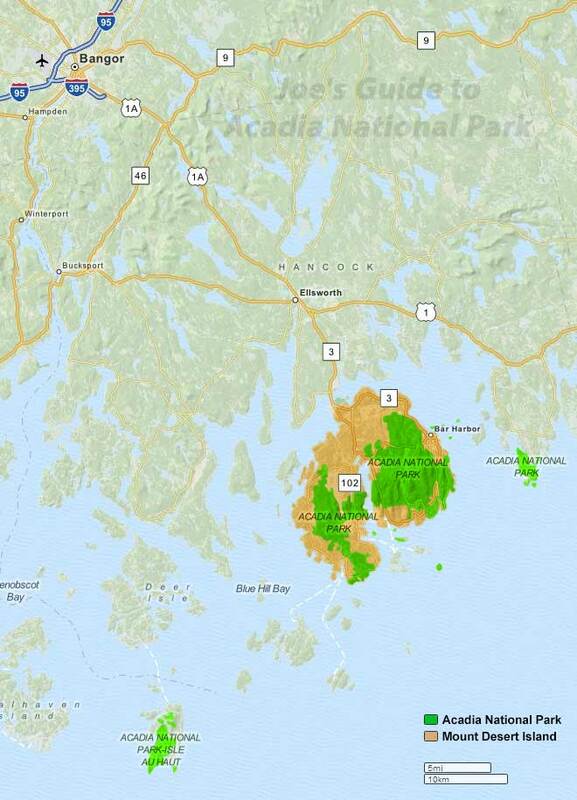 Roughly half of the island is part of Acadia National Park. Access is via boat service from Stonington.